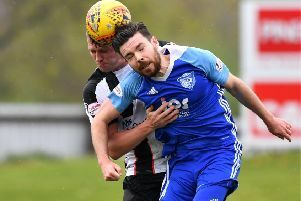 Peterhead were determined to chase down league leaders Edinburgh City and gain revenge on a Wee Rangers side that left Balmoor Stadium with five points out of six last season. The home side had the first chance inside the first minute, full back Jason Brown seeing the ball late from a free kick out on the right by Willie Gibson and powering his header over from eight yards. The ferocious wind was causing havoc every time the ball went above waist height and that may have affected a shot by Simon Ferry after 10 minutes that went well over when better was expected. The match then went into a lull with plenty of neat passing football from the Blue Toon but no end product whilst the visitors were content to sit in with the gale blowing straight at them. The crowd had a rare moment of excitement in the 33rd minute, a Jamie Stevenson free kick from 20 yards out that looked in but hit the side netting. The tempo was higher from Peterhead at the start of the second half and a 56th minute shot from a central position just outside the area from Rory McAllister pulled out a good save low down by Sean Brennan with the keeper stopping a well hit effort then turning it clear as it almost squirmed under his body. But the visitors should have taken the lead on the break after 65 minutes. Daryl Healy sprinted down the right wing and his pass inside set up Paul Willis and it took a superb save from Greg Fleming to stop a certain goal with Healy putting the rebound wide for their best chance of the game. The opener eventually arrived in the 74th minute thanks to some superb build up play from Stevenson. He jinked his way into the right side of the penalty area before putting in a low cross which looked like it might sneak in at the back post but McAllister arrived to make sure from point blank range and an audible sigh of relief could be heard around the stadium.